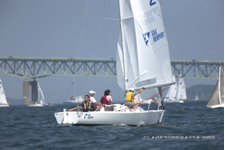 While the 2015 Blind National Sailing Championship won’t take place until September in Newport RI, last year’s 2014 blind sailing championship regatta was a fabulous event. The 2014 regatta provided two days of great racing between Rose and Goat islands with fierce competition between seven teams over 12 races. Congratulations to Duane Farrar, Solomon Marini, Denis Bell and Amy Bower for winning and being named the 2014 Blind National Champions. Mike Dwight May 29, 2015 Category: Uncategorized.